With a steady hand, he calmly held a small sewing needle and ever so gently picked up tiny brown beads one-by-one. Curtis Oland, a fourth-year Ryerson fashion design student was taught traditional woven beadwork on a bead loom by his grandmother. It takes one hour to complete one inch of beadwork. For Oland, it’s only the beginning. As an emerging designer, Oland has figured out how to keep his traditional Indigenous culture alive. However, he’s not the only one. There is a movement among Indigenous fashion designers, who are reclaiming their cultures and challenging the often misuse of their traditional customs, by fusing contemporary designs with traditional elements. In his small downtown Toronto apartment, overflowing with piles of horsehair, leathers and fabrics, Oland worked tirelessly to complete his first major menswear fashion collection, “Harvest,” which debuted at Ryerson’s 2016 Mass Exodus fashion show. “The image of a scar going up a tree. That was the starting point for my collection,” Oland said. To spread the ashes of his late grandfather last summer, Oland and his family travelled to their traditional First Nation territory of Lil’wat in Mount Currie, B.C. The time he spent in Lil’Wat had an unexpected impact on him. He experienced a few “culturally jam packed days,” which ignited new interests in his Indigenous heritage. It was cedar basket weaving that ultimately triggered the inspiration for his collection. “They rip a strip up the tree and maybe it’s like a foot long or a foot wide. Then they move to the next tree. They can’t technically rip all the bark off because the tree would die,” he said. Oland saw beyond bark ripped from a tree. He saw a scar; he envisioned Harvest. “You take what you need. You don’t harvest everything; you want to leave some for the rest of nature. You want to keep the balance,” he said. This experience led Oland to fuse his cultural traditions with modern designs. Explore Oland’s collection that was presented at Mass Exodus 2016. Learn more about his inspirations and the materials he chose to incorporate into his designs. Oland’s collection has become a springboard for him to keep his ancestry alive, to continue learning more about his heritage. While Oland is in the early stages of navigating the fashion world, Angela DeMontigny, a Cree and Métis designer and stylist, has become a pioneer in the Canadian and Aboriginal industry. She’s been thriving for almost 30 years and has her own boutique in the heart of downtown Hamilton; filled with her luxury men’s, women’s and bridal collections, jewelry, handbag and candle lines. Not all Aboriginal fashion designers are so lucky. So, what’s DeMontigny’s secret to success? It’s being on trend in an original contemporary way but never losing her aboriginality. She is passionate about designing, but fusing it with different traditional Aboriginal elements. For DeMontigny her designs are not just simple pieces, they are her works of art, a symbol that Aboriginal cultures are still flourishing. While attending residential schools, many Indigenous children were forced to be ashamed of their Indigenous roots, resulting in far less knowledge transfer of traditional techniques and culture than ever before. As a result of their experience, many cultural traditions “didn’t get passed down for a few generations,” she said. For survivors, it was out of fear and protection. Despite the scars left by residential schools, a shift towards reclaiming Indigenous cultures are beginning to heal those wounds. The remote fly-in Ojibway community of Webequie First Nation (located on Winisk Lake, more than 500km north of Thunder Bay) was looking to reinvigorate their community, and help reconnect its youth with their culture, following years of teen suicides. In 2011, DAREarts, a charitable organization that works to empower youth, partnered up with Webequie elders and community members. The project? A fashion show. Marilyn Field, founder and president of DAREarts, reached out to her friend, fashion journalist and entrepreneur, Jeanne Beker. Beker then put her in touch with D’arcy Moses, a world-renowned Aboriginal designer from the Northwest Territories. Under the mentorship of Moses and the elders, the kids handcrafted and beaded – in their own personal styles – vests and traditional mukluks using different fabrics, furs, moose hide and caribou leather. “It was a miracle. [Moses] came in with his sewing machine and boxes full of bits of fur and leather, his grandmothers knowledge, and his modern sensibilities,” Cathy Elliot, DAREarts’ First Roots Aboriginal program associate said. Flying in sewing machines to the remote community, with his celebrity appeal, Moses became an inspiration. The pieces took months for the youth to create. They compared bloody fingers that were repeatedly pricked by their metal needles with pride in their efforts. They often didn’t want to leave school, and after hours continued working on their designs. “We had to kick them out… They were just determined to finished their work,” Elliot said. 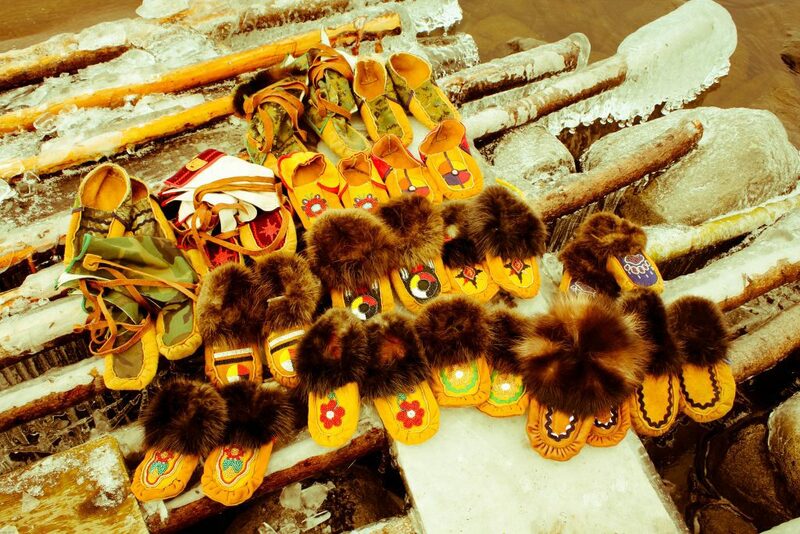 Some of the Mukluks made by the Webequie youth that incorporates beadwork, furs, hide, fabrics and leather. Photo courtesy of DAREarts. DAREarts had never done a fashion show before, but to their surprise, the show became a collective community effort, culminating in a celebratory feast. What the DAREarts project highlights, is the importance of fostering Indigenous culture through the art of fashion. “Through the arts [the youth] can express who they are,” Elliot said. So, why is the preservation of Indigenous culture through fashion so important? “I have always felt that my ancestors were within me, and now is the time [to] answer their call. I feel like the gifts I have been given, my skills as an artist, as a designer, can be used to a greater effect, and now is the time to do it,” Oland said. For Indigenous peoples, fashion isn’t just another fad, or trend; it’s heritage, traditions, memories, and art, preserved through generations to keep histories alive. It’s a way of life, a common thread that binds communities together. 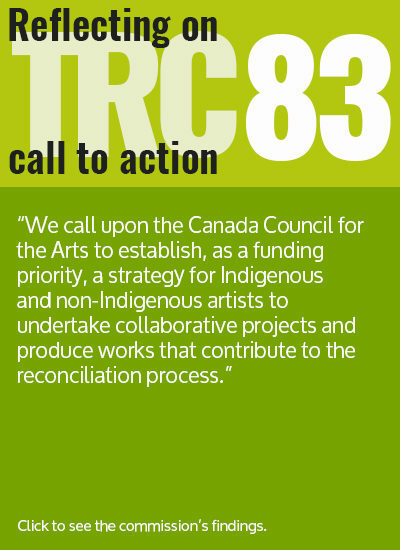 “This is not about just Indigenous peoples. This is about Canada. This is about every single person who lives in this country,” Baskin said.